BRUSSELS, Belgium, June 7, 2012 (ENS) – The CARS 21 Group Wednesday adopted its final report, recommending a portfolio of propulsion technologies dominated by advanced combustion engines, yet increasingly electrified. While the internal combustion engine will remain dominant to 2020, alternative fuels, including electricity, hydrogen, biofuels, methane and liquefied petroleum gas, will be necessary to meet the CARS 21 policy objectives. Part of the European Commission’s industrial policy, the Competitive Automotive Regulatory System for the 21st century, or CARS 21, was established in 2005 and reactivated in 2010 to set a public policy strategy and regulatory framework for the EU automotive sector to 2020. 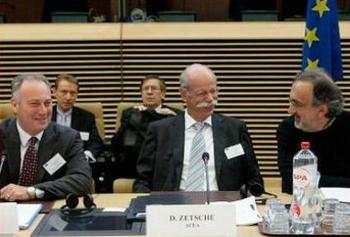 On June 6, the members of the CARS 21 High Level Group had their final meeting and approved the report, which outlines actions to be taken on electro-mobility, road safety, intelligent transport systems and market access strategy as well as review of the regulations governing greenhouse gas emissions from cars and vans. Participants included: Siim Kallas, EC vice president and transport commissioner; Neelie Kroes, EC vice president and digital agenda commissioner; Antonio Tajani, EC vice president and industry and entrepreneurship commissioner; and Environment Commissioner Janez Potocnik. Sergio Marchionne, president of the European Automobile Manufacturers Association, took part along with Dieter Zetsche, chairman of Daimler AG and head of Mercedes-Benz Cars, Stephen Odell, chairman and CEO of Ford of Europe and other auto industry executives. Implementation of recommendations spelled out in CARS 21 Final Report will bring about many changes. Roll-out of alternative infrastructure will be in step with technological development to enable the market penetration of vehicles powered by alternative fuels. 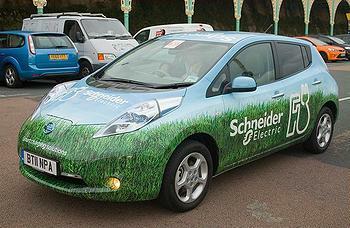 Electric vehicles will become a valid choice for European consumers. Charging of electric vehicles is expected to be performed mainly at home and at work, but publicly accessible recharging infrastructure will be needed. In order to ensure interoperability across the EU, standardization of recharging infrastructure on the European level is needed. The commission will start an impact assessment of legislative options and technical modalities to ensure that “practical and satisfactory” infrastructure solutions are implemented throughout the EU. Clean and energy-efficient vehicles will be produced in Europe. Breakthrough technologies, including electrification of combustion engines, hybrid and electric vehicles, fuel cells, electrical and electronic systems, will be developed with continuous European Investment Bank support to the automotive sector. In order to achieve ambitious goals in climate change policy areas, the CARS 21 Group wants an integrated approach. “Measures to be taken must be proportional and in line with the principles of cost-effectiveness and better/smart regulation, taking also into account the affordability of new vehicles,” the group said. A new driving test-cycle and test procedure for measuring fuel consumption and emissions will be developed to be more representative of real-world driving and address the climate and air quality challenge. This will be complemented with measures controlling vehicle emissions and contributing to improved air quality. Road safety will be improved, based on complementary actions on vehicles, infrastructure and driver behavior. EU trade policy will aim to maintain a strong and competitive automotive manufacturing base, using multilateral and bilateral tools to remove both tariff and non-tariff barriers. Multilateral regulatory cooperation within the UNECE framework will be complemented with bilateral regulatory cooperation with emerging countries, and also with the United States and with Japan. The European Commission has announced its intention to adopt a Communication on the outcome of the CARS 21 process. The Communication will announce how the Commission proposes to implement the policy recommendations of the group in its policies. Finally, a CARS 2020 Group will be established to monitor the progress achieved in implementating the CARS 21 Group’s recommendations.